"Wait, I see what you are doing. You are trying to seem cool and aloof, because you know women like that." "No, Hume, once you realize the flesh decays and rots away, and physical beauty passes, you will realize that pursuing it cannot bring you lasting pleasure." "Lasting? I'm only looking for about five minutes!" David Hume had very similar ideas to Buddha about the nature of the self, or rather, about the nature of the not-self. He believed that human existence was nothing more than a "bundle" of experiences together, and there existed no further thing which did the bundling. The Buddhist doctrine of anatta also claims there is no self at all. In fact, Hume might have gotten this idea from Buddhism, as there were very early translations of Buddhist texts available around that time where Hume was living. 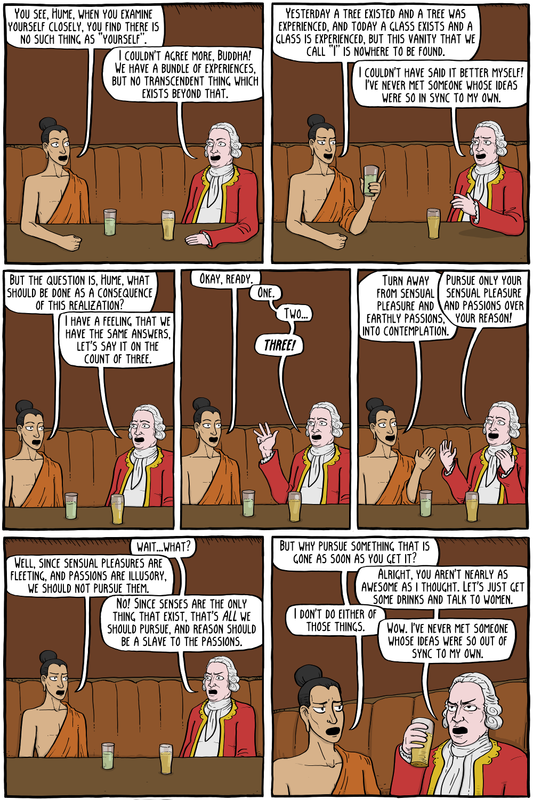 The conclusions that Buddha and Hume drew from the fact that no self exists, however, couldn't be further apart. Whereas Buddha teaches something like turning away from desire, passion, and temporary pleasure for meditation and moving towards an enlightened state, Hume says exactly the opposite. While he doesn't exactly give a defense of Hedonism, he famously said that reason should be a "slave to the passions." In other words, our desires and passions should come first, and reason should merely be a tool to figure out how to obtain them. Hume himself was known for being a bit of a socialite and ladies man during his time in Paris.